The Chicago Bears have plenty of questions about the future of their franchise, and on Tuesday it appears that there is at least some clarity regarding their quarterback situation for 2017. According to Jeff Darlington of ESPN and Adam Jahns of the Chicago Sun-Times, the Bears are actively shopping quarterback Jay Cutler on the trade market. 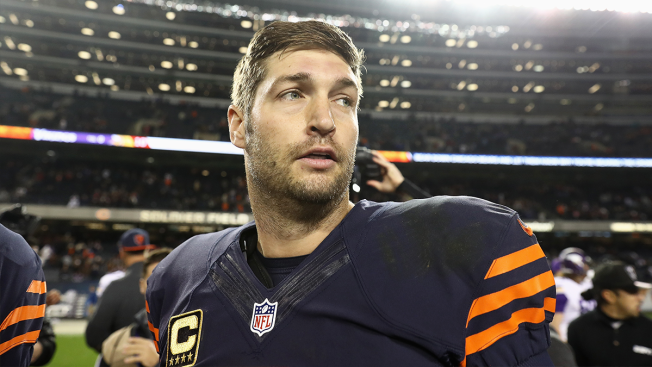 Cutler, who signed a massive extension with the Bears before the 2014 season, is owed no more guaranteed money as part of the contract, and it appears that the Bears are going to go in a different direction at quarterback next season. Of course, there are variables that have to be considered with Cutler’s potential departure. First and foremost, teams could be hesitant to give up much for his services considering that he could just walk away and refuse to play for a non-contender, according to Darlington’s report. As an added obstacle, teams could be put off by having to pay Cutler money this season, and could instead wait for the Bears to cut the quarterback and allow him to sign a brand new contract for next year, with Cutler able to pick his preferred destination in free agency. Even with that in mind, there are still plenty of teams who could potentially look into acquiring Cutler. Reports have linked Cutler to teams like the Cleveland Browns and Arizona Cardinals, with other clubs like the New York Jets and San Francisco 49’ers also in need of new men under center for the future. If the Bears do move on from Cutler, there are a slew of options they could explore. They could acquire another quarterback in a trade, with New England’s Jimmy Garoppolo and Cincinnati’s AJ McCarron looked at as the leaders in that race, or they could draft one, with Mitch Trubisky and Deshaun Watson likely the top two ranked quarterbacks in this year’s draft class. Finally, the Bears could strictly look in-house for a solution, with Brian Hoyer, Connor Shaw, and Matt Barkley all still potential options. With all of that in mind, nothing official can be done about the situation until March 9, when the new NFL league year begins, so there is still plenty of time for the situation to play out.